(I'm picturing someone who looks a lot like Lex Luthor) proposed divvying up the Golden State into six new states that sounded a lot like the single-enterprise districts in THE HUNGER GAMES: the technology state, the agricultural state, the Hollywood state, the flat hot boring state, etc, etc. How about you, Reds? Can you see your states shifting boundaries? Or is it an idea best left for mustachio-twirling billionaires? HALLIE EPHRON: VERY interesting politics in Maine right now. Just for example that referendum on whether to overturn the Governor's decision not to take funding to offset insurance costs? And you've got Senator Susan Collins and Governor LePage: talk about a state of contrasts. Massachusetts? We gave birth to Scott Brown and Elizabeth Warren. For sure. East and west. Just look at how they vote politically. But maybe that's a reason to keep the halves together. Disagreeing isn't a reason to divide. HANK PHILLIPPI RYAN: Yes, agreed about Massachusetts. East and West are --well, wait. Not necessarily. But I wonder if the Cape and Islands would like to secede? It's bursting with tourists in the summer, and bleakly (and beautifully) empty in the winter. So there could be the State of Boston, and surrounded by the state of Hightechistan, bordered on the West by Appleachia (Orchardia?) and the Cape and Islands could be Touristiana. Still. I think we should stick together. Not that, ahem, it generally matters on national election days. RHYS BOWEN: Julia, there have long been proposals to divide California into North and South. I'd have no problem with that as long as Silicon Valley and San Francisco and Monterey were clearly in the North where I live! Actually a more thoughtful proposal these days, which I believe has been gathering signatures, is for California to leave the US and become its own country. I believe we are the 5th wealthiest country in the world on our own. Normally I'd chuckle at such a suggestion, but given the current political climate and white nationalist marches, it's beginning to sound more appealing! JENN McKINLAY: I'm originally from CT. I don't think we can carve that sucker up much more or there won't be anything left. But now I live in AZ, where eighty percent of the population is in the Phoenix and Tucson metropolitan areas. There is vast desert that is uninhabited here, there are mammoth national parks, and twenty plus Native American tribes that are self-governed, mostly. The urban centers and the outlying areas definitely have differing political philosophies but I think, as was observed by Hallie, that we do better together than we would apart. The one thing about all the wide open space is that there's room for everyone. Truly. INGRID THOFT: Washington State already feels like two states with the Cascade Mountains serving as the dividing line. Seattle and Puget Sound lay west of the mountains, which accounts for our rainy, gray weather. Once you traverse the mountain passes, which close frequently in the winter months, you find yourself in dry, sunny eastern Washington. It’s not just the geography and weather that separate us—it’s the politics. Seattle and its environs are blue state territory, but the rest of the state is red state. I agree that we need to stick together though; ideally, our differences make us stronger. Another reason? All the wonderful wineries are in eastern Washington. Who wants to secede from that? DEBORAH CROMBIE: Texas is its own special case, as it is so big that we have everything. Well, almost everything, as our highest mountains are only half as high as Colorado. We have north Texas Prairie, where I live (really lovely once you get out of the cities, not that different from parts of southern England), the Cowboy Plains of west Texas, the Piney Woods of east Texas, the Swampy Gulf of the southeast, the Borderland south, and mountainous high plains of the southwest. I'm sure I've left out something... Oh, yeah, the Hill Country, west of Austin, which is absolutely gorgeous. Especially in the spring, with bluebonnets. Politically, we are just about as diverse, although you wouldn't know it from our senators and representatives. Every major metro area in Texas votes blue, so I'm not sure exactly how the silly secessionist trolls would divide us up. We are better together. 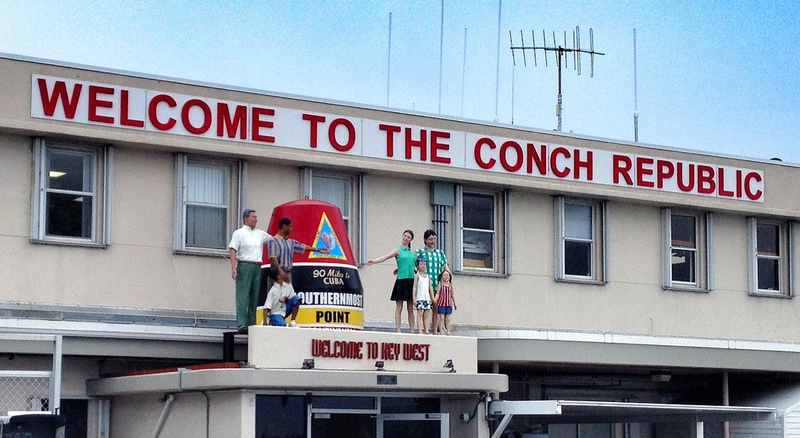 LUCY BURDETTE: Florida is huge too, it takes us two days to drive down the length of the state! All I can say is that the Keys tried seceding from the rest of the state in response to a US Border Patrol blockade up in Florida City. The new entity was called the Conch Republic and the natives are still referred to as conchs. SO WHAT ABOUT THE REST OF YOU? Are you in a state that could feels dis-united, and is that a good or a bad thing?? While I'm not too sure about any of this, I know there are folks advocating a split between northern and southern New Jersey . . . .
Joan, New Jersey was one of the states I was thinking about. Call the metropolitan area New Jersey York and the rest of the state (which always surprises me with how small-town and bucolic it is) The Garden State. Great idea about New York! Where do I sign? You must be from upstate like me, Judi! Yep. That's why I deleted the comment although I seriously considered leaving it for the very reason you cite. Although Texas was supposedly given the right to split up into smaller states when it was annexed into the United States in 1845, I think the legality of that idea was pretty much nixed sometime in the Civil War. Seeing as some of our counties are bigger than Jenn's Connecticut, and at least one of our airports is bigger than Manhattan, I suppose it wouldn't hurt us any to split up, but Texas has an ego as big as the state. I just don't see Texans rushing to get smaller any time soon. I also think Texas is way too invested in songs about Texas to split into constituent parts. There are approximately 5,849 country songs with the word "Texas" in the title or chorus, and there's no way we're going to get all those copyright holders to change to, say, "God Bless Piney Woods" or "All My Exes live in the North Texas Prairie." I sincerely hope Texas stays as it is. Imagine it fielding 12 senators instead of two. Ann, in that case maybe a few of those senators would actually reflect the real majority in the state???? Julia, you made me snort my coffee... Now going to sing "All My Exes Live in the North Texas Prairie" all day. I quite like that. I don't have a lot of patience with this kind of thinking, taking their ball and leaving the field. It sounds a lot easier than trying to work together, but in the end it really isn't. There's a reason why Europe tried to emulate the United States--emphasis on the "united"--and that's because there is strength in numbers, and in combining the wealth of natural resources and brainpower we possess. I agree, splitting up states would only make what, to my mind, is wrong with this country worse. Which is that we don't listen to other viewpoints and too often act in our own personal best interest. It's easy-peasy to divide us all up. The harder part, as Karen notes, is to work together--within and across our state boundaries for the common good of everyone--respecting that little thing called the Constitution and its Bill of Rights. In the 1970's I was a dress buyer for a local chain of stores, making frequent buying trips to NYC. It never failed to amuse me when New Yawkuhs asked me what time zone Cincinnati was in! They were always astonished, and in one case actually miffed, to find out it was the same one they're in. We lived in NE Ohio for years. Southern Ohio could be a totally different state from the industrial NE. Good grief! Even Cleveland is split between eastsiders and westsiders. I was born in Southeastern Ohio and have a lot of family there, but grew up in Columbus; married someone from Northwest Ohio whose family has Cleveland area roots; and my son has chosen to build his life in Cincinnati. So I feel like I know this state. My sense is that Northeast and Northwest Ohio aren't that different, but Columbus and Cincinnati each definitely have their own personalities, and Southeastern Ohio is definitely Appalachian. However, I agree with all those who have already stated that the last thing we need right now is anything that divides us more. I really, really want to see some re-uniting and looking for the common good! North Carolina used to be a very purple state, but egregious gerrymandering has made it a red state with a ribbon of blue in the middle. But rather than splitting it up, I'm hoping we can fix the districts. Re: California, a friend asked why it should be a separate country when it's already a separate planet. The same thing happened in Ohio--very specific districts and their reps/senators were targeted--you'd think they spoon-fed some four-year-old kids a 5-lb bag of sugar and turned them loose on the map of Ohio with a bunch of markers! Re Jenn's comment about Arizona, I'm pretty sure a few years back when their governor was putting some VERY right-wing policies in place, there was a movement for Tucson to become it's own city-state, Baja Arizona. Pretty sure it was satirical, as their motto was going to be "We're Not All Like That." Ha ha ha! Ah, yes, Jan Brewer, what a nightmare. Good one, Jim! I live in a town in Massachusetts called Newton, which is made up of eight villages or so. For some reason. Each one has a very clear identity, it’s fascinating! But we just voted for a new mayor, and the town was, apparently, split north and south… By economics. So people are certainly out for themselves. I always love that scene in the Once and Future King, when Merlin flies Wart like an eagle, and they realize there are no boundaries. Wow Hank, my grandparents used to live in Newton and I would spend a week in the summers with them when I was a kid. We lived in Newton Centre for a few years. I was always struck by how each of the villages had such a distinctive personality and reputation. Georgia, as I am sure you all know, is the largest state east of the Mississippi, but would be impossible to divide along political lines. It is a red state enlivened by blue dots where the cities are. Geographically it is much easier: the foothills of the Appalachians, the Piedmont, the Coast, and Below the Gnat Line. This looks fair and reasonable until you take the numbers into account. Here's the problem. California has almost 40 million people. 25 million of those live in the LA area or the Bay area. 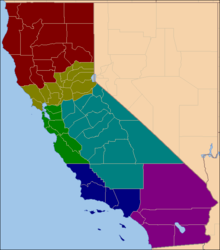 If California were divided up into six states as shown, the 25 million people in LA and San Francisco would have 4 senators representing their interests, which tend to be liberal. The other 15 million people would have 8 senators representing their interests, which tend to be conservative. No wonder a conservative billionaire is pushing this. This is like gerrymandering, but much worse. And it all comes into focus, doesn't it? I remember reading an hysterical op ed piece 40 years ago on why Texas should secede from the union. The reason was so it could qualify for foreign aid. At that time, don't know about now, Texas produced pretty much everything it needed. A large portion of the Articles of Secession included the creation of a bourbon corridor, from Tennessee to Dallas, allowing free access from distillery to market to consumer. What do you think Deb? Could maybe Oklahoma annex McKinney? Texas makes bourbon now. And vodka. I was born and raised in Connecticut. I spent the first half of my life in Fairfield County and always felt that I was more of a New Yorker than a Connecticut resident. I'm now one town over into New Haven County, and still identify more with New York than with Connecticut. For me, Connecticut TV channels didn't exist until I moved into New Haven County. So, if it's necessary to break up this tiny little state into parts, how about making Fairfield and New Haven Counties one state and the rest of the counties in the state could form some other state. Or, all of the Yankee fans could comprise one very normal state and Those Other People(you know who you are!) could be another state. You'd lose some of your most beautiful landscape... all those inland lakes. I'm not a lake person. Actually, I do have a sister who lives at one of the inland lakes and it's nice there in the summer but I'm much more of a Long Island Sound sort of person. I live a couple of blocks away from the sound and I drive along the water to get to and from work every day, which to me is just the most relaxing way to start and end each day. In Canada, we have real experience with this question with our beloved Quebec. A couple of referenda for the province to secede failed to win majority support from voters across the entire country. We may not understand their unique French-Canadian culture, language or politics, but, it seems, we want them in our country. These type of politics are fueled by emotion, I think. While fascinating in theory, they are wrenching on a nation’s spirit and can drive wedges deep into communities and families. But, then, maybe all vigorous and visionary politics run that risk? Thanks for firing up my brain on this cold morning on the Canadian prairies! Amanda, I'm very glad that Quebec did not secede! I can't imagine Canada without Quebec. I know that many northern Californias resent us So Cal people. They'd be happy to see us go. Heck, it's an act of rebellion for me to live down here. I'm in Massachusetts and think the idea of separating by ideology or whatever farcical reasoning that may be employed is simply ridiculous. I have no use for either side in the political divide since they are all liars in some form or another. Instead of live and let live, everyone is all ready to pounce up and down on others for doing stuff they wouldn't do as if it is there right to tell others how to live. I'm done with all of that. The only kind of division I would be interested in would be me winning enough money to buy my own island and give birth to the nation of Jaylandia, where I could listen to music, read books, watch TV and movies and do my writing to my heart's content...with a nice steak dinner every night. By the way, if you want to read a story about how dividing things up would be a horrifying disaster, you should check out the graphic novel series Lazarus by Greg Rucka. It's primarily an action adventure story but he does an incredible amount of world building in both the dialogue to the stories and in the text pieces that go with every story. Oh, I'll check it out. I love a good graphic novel. St. Louis commentators have pointed out the divergence of Missour-ee and Missou-rah. Urban St. Louis vs. the "rural values" of much of the rest of the state. One proposal was to annex St. Louis to Illinois, making it West St. Louis. This was all tongue in cheek, as the serious proposals would involve uniting St. Louis City and County for a stronger region. Jim's point on gerrymandering is appropriate as well, and my niece's concerns about unbalanced representation in the Electoral College. It's a mess that's going to take much time to fix. My dad grew up in Kansas City, Missou-rah. Texas was a Democrat state until when? Seventies? Eighties? Can't remember. Senator John Tower was all by his lonesome as a Republican for a long time. I think every other year someone pushes for Texas to secede and become a republic again. Geographically we could easily be five states. If we went that direction I think I would make Austin a totally separate entity as it gets weirder by the year. All those politicians and land developers. It used to be we were "different" only due to living in the city v the country. I was happily in both worlds with family living out in the boonies and in the big cities. I still enjoy the friendliness and courtesy displayed in small towns and rural areas. You can find that in the cities too but not as easily. As for splitting up the state, I think we have too many connections to do that. I would be much happier exporting our politicians and starting from scratch. Kentucky is much more diverse than those not living here might think. Louisville is pretty much big city, but Lexington, while the 2nd largest city, maintains some of its horsey, genteel atmosphere. I'm in Owensboro, which is one of the larger cities, but is more like an overgrown rural town. I don't know how I would divide Kentucky, but I sure wish there were a way to divide it from Rand Paul and Mitch McConnell. We live in beautiful Northern California in the shadow of Mt. Diablo.....pretty much the perfect place for me, politically, culturally, aesthetically. I don’t think the US is going to be dismantled anytime soon. What’s more interesting is to study the EU. That ‘baby’ is certainly going to implode in the next decade or two. It has already started with the Brexit vote, and I predict that more countries will follow suit.